Nuance Communications, better known as the folks whose technology powers Siri for the iPhone 4S, have released a standalone Siri-like app for Android today. It’s called Dragon Go! and it is, without a doubt, the best Siri alternative for Android. Check it out after the break. As we’ve mentioned in the introductory paragraph, Dragon Go! 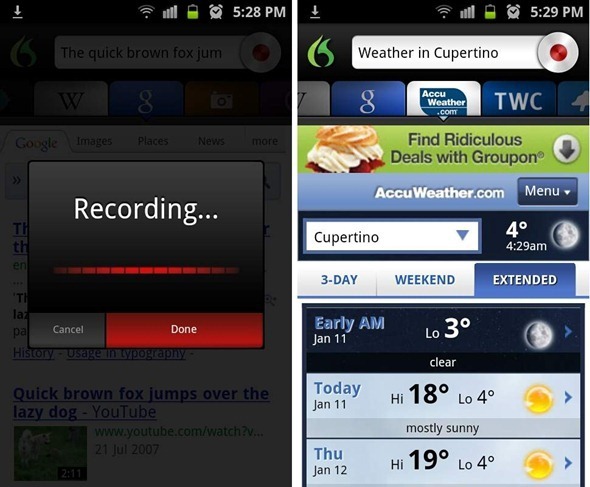 has been developed by Nuance Communications, Inc. – the same company whose technology powers Siri on iOS. With Dragon Go! you can do more in less time like buy movie tickets as you walk into the theater, go shopping at local boutiques while you wait for your nails to dry, settle a bet at the breakfast table on the square root of Pi, or plan and invite guests to that night’s happy hour – all with just one ask of Dragon Go! We’ve tested the app on a Samsung Galaxy S II on Android 2.3.3 Gingerbread and can confirm that it works as advertised. In a manner similar to Siri on iPhone 4S, you can ask Dragon Go! all sorts of questions. These audio queries are processed by Nuance’s servers and then sent to one (or more) of the appropriate services such as Wolfram|Alpha, YouTube, AccuWeather, Dictionary.com, Last.fm, Pandora, IMDB, Wikipedia, Yelp, Google, Rotten Tomatoes and Fandango, just to name a few (Dragon Go! accesses 200+ services). Because it is a third-party app, Dragon Go! doesn’t integrate with your Android device’s system apps, so you can’t set alarms, fire off emails/texts etc. as you would with Siri. If you are interested, live in the US* and have an Android device running Android 2.1 or above**, then Dragon Go! can be downloaded for free from the link embedded below. Be sure to let us know what you think of it by leaving a comment over on our Facebook page! *Those of you outside the US will be disappointed to know that Dragon Go! is US-only at the moment. However, seasoned Android enthusiasts know that there is a way: if you have a rooted Android smartphone, you can install an app like Market Enabler [Market Link] and sort of fool Market into thinking that your device is in US. Just be sure to choose USA T-Mobile when you launch it! **Dragon Go! does not support Android 4.0 Ice Cream Sandwich, yet.